FREE or $0.07 Comet Stainless Steel Cleaner! WOW! 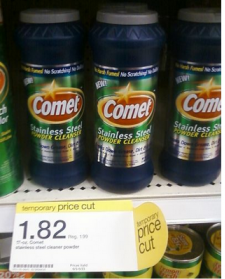 Check out this awesome deal you can get on Comet at Target until 6/23! To make an even better deal, even if only by a few cents, there is a $1.25/1 any Comet Stainless Cleaner coupon to print out if you are a Coupons.com Savings Club member. This will make it free, or give you overage if your store allows it! Right now, you can try the Savings Club for a month for free by clicking here. There are many exclusive, high-value coupons to print out that you truly can't find anywhere else! I didn't know comet made a stainless steel cleanser. good to know.